Grapes originate from Central Asia and the Mediterranean. They grow on a woody vine in large clusters. The come in green, blue, red, black and golden varieties, the most common being the red. All dark-skinned grapes contain antioxidants that are beneficial for your health. Red grapes have a number of health benefits, mainly because they are rich in flavonoids – the chemicals that give grapes their red color. The two main flavonoids in this fruit are quercetin and resveratrol. Resveratrol, known for its anti-inflammatory effects, makes it beneficial for arthritis and heart disease. It also helps reduce the risk of cancer. Quercetin is a powerful antioxidant that can combat free radicals, protecting the body from disease and reducing the effects of aging. It is also an antihistamine, so it can help reduce the symptoms of seasonal allergies. Like red rapes, black grapes contain vitamins C, B-1 and B-6. Black grapes also contain quercetin and resveratrol. So they are equally good for reducing cholesterol and reducing the risk of heart disease. They also contain substances known as phenolic acids. According to a 2008 study conducted by S.M. Huang et al. published in Molecular Nutrition and Food Research, phenolic acids can protect cells from diabetic neuropathy. This is a complication of diabetes, in which high blood sugar levels damage the nerves. Both black and red grapes contain resveratrol. Because it is in the skins of the grapes, dark-colored grapes contain a higher concentration than green ones. 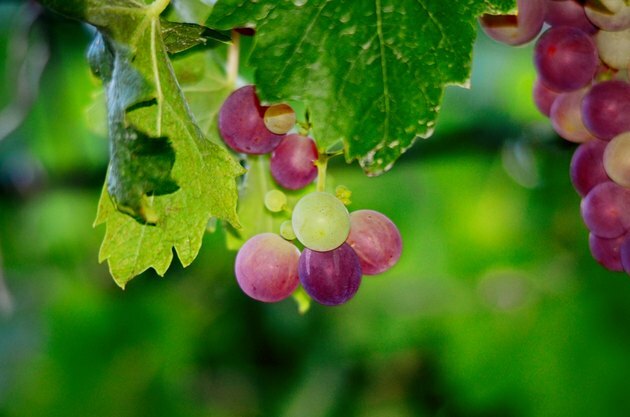 Resveratrol may help reduce the risk of prostate cancer, boost the immune system and reduce the effects of inflammation. Other foods containing resveratrol include cranberries, blueberries and peanuts. You can also obtain resveratrol as a supplement. Dr. Martha Grogan, MD, explains that eating whole grapes, particularly the red or black varieties, can also have the same benefits as drinking juice or wine, plus the added benefit of the fiber from the fruit. If you choose to obtain your resveratrol from red wine, remember to drink in moderation. According to Dr. Grogan, this means no more than one glass per day for women and no more than two glasses per day for men.